The corner of Wisconsin Avenue and Water Street from the WUWM office. Lake Effect's Mitch Teich with HowLoud founder Brendan Farrell. "Noise is part of our everyday life.," says Brendan Farrell, founder of HowLoud, Inc., a web-based service that maps noise levels in places around the country. 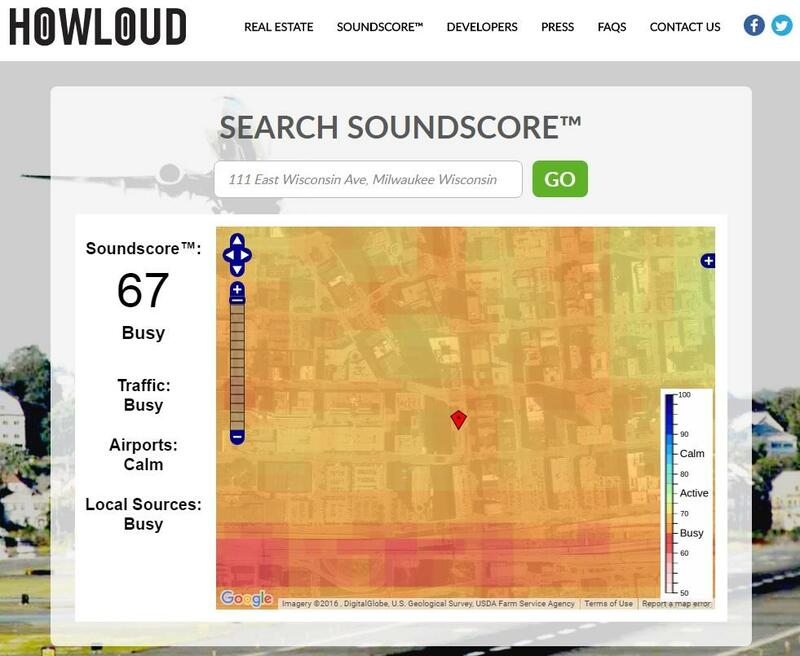 HowLoud has multiple uses surrounding the noise level in any given area. Want to know which hotel is the quietest or if you'll hear airplanes in that new neighborhood? They will bring the information to you. The Soundscore of the corner of Wisconsin Avenue and Water Street, described by many as the heart of downtown Milwaukee. There are two factors that determine how loud an area is: the Soundscore (with adjectives to describe the noise source) and the map display. The Soundscore rating was developed through technology made by HowLoud. Numbers that score the location based on environmental noise range from 50 (very loud) to 100 (very quiet). That score is determined by three noise factors: vehicle traffic, air traffic and local sources (schools, shops, restaurants, etc.) - which are describe as either calm, active or busy. The displayed map is also color coated with the loudest areas appearing in red and the quiet areas in blue. HowLoud currently covers the top 1,000 largest urban regions with the next 3,000 going live by the end of this month. As HowLoud continues to develop, Farrell says he is happy that people are turning to the service for help. He also notes that assessing the sounds around you is "part of the quality of life...It's satisfying to see that it's now available and that people are using it and choosing what homes to go look at, which homes are worth driving across town to take a closer look at." The Milwaukee City Council paved the way yesterday for the Milwaukee Bucks to construct a new basketball arena. Some in the community, such as Common Ground, had hoped the city would tie support for the arena to the Bucks’ support for other recreational facilities in the community. The Waffle House may seem an unlikely source of inspiration for chefs in a northern city like Milwaukee, especially when you consider there are no Waffle Houses in the state of Wisconsin. But the folks from Milwaukee Chefs for Homeless Vets are hoping the Southern-style fare will entice even the cheesiest of Cheeseheads to come out and support their cause.